This year I ran a total of 14 Rock ‘n’ Roll Half Marathons. I am so glad I purchased the TourPass last year. I know it is available for next year and if you are on a mission to run a race in each state then the TourPass is for YOU! Each race is different but special to me. Each race gave me the opportunity to visit a new city and I enjoyed my stay in each one. So in a nutshell. Arizona was my first one. I loved the weather and the course. St. Petersburg was a HOT one. Too bad it is cancelled for next year. I cried when I got to the hotel and found out my reservation had been cancelled. Luckily they were able to accommodate me and get me a room at the last minute. I just LOVE, LOVE Washington DC. I swear I lived there in a previous life. Luckily it did not rain like it was supposed to but there was one killer hill around mile 6. Brutal! It may not have rained in DC but it was pouring in Nashville. It rained the whole time I was running up and down those darn hills. I was MISERABLE. That was my least favorite race. Portland was so much better. Great weather and decent course. Another trip to the west coast to San Diego. It was a humid race day but I enjoyed my time in San Diego. And finally another trip to the west coast to Seattle. It was a hot day and the course was hilly. Sweet home Chicago! I love running in my hometown. That day I also ran my 100th race. Oh and I was also dehydrated and did not think I was going to finish the race. And then I went to the east coast to Virginia Beach. What’s not to like about the beach? The course was mostly flat but it was HOT and HUMID. The best part was the finish line by the beach. Back to the east coast to Philadelphia. Perfect weather and flat course! I also enjoyed my time in Philadelphia. And again to the east coast to Providence. Great running weather but hilly course. This is another race that is cancelled for next year. Oh Cleveland, I was not my usual self that day. I was tired and dehydrated on race day. However, for being an inaugural race, everything went well without a glitch. Meet me in St. Louis at The Arch. It was a beautiful day on Saturday but on race day it was cold (28 degrees). It did get a little warmer throughout the race. And saving the best for last but my favorite race was in Las Vegas. It was so much fun to run along the strip at night. The expo was great and the VIP experience was amazing. I have no regrets at all for traveling across the country to run these races. It was worth it! I learned a lot about myself during each trip and made the best out of each one. 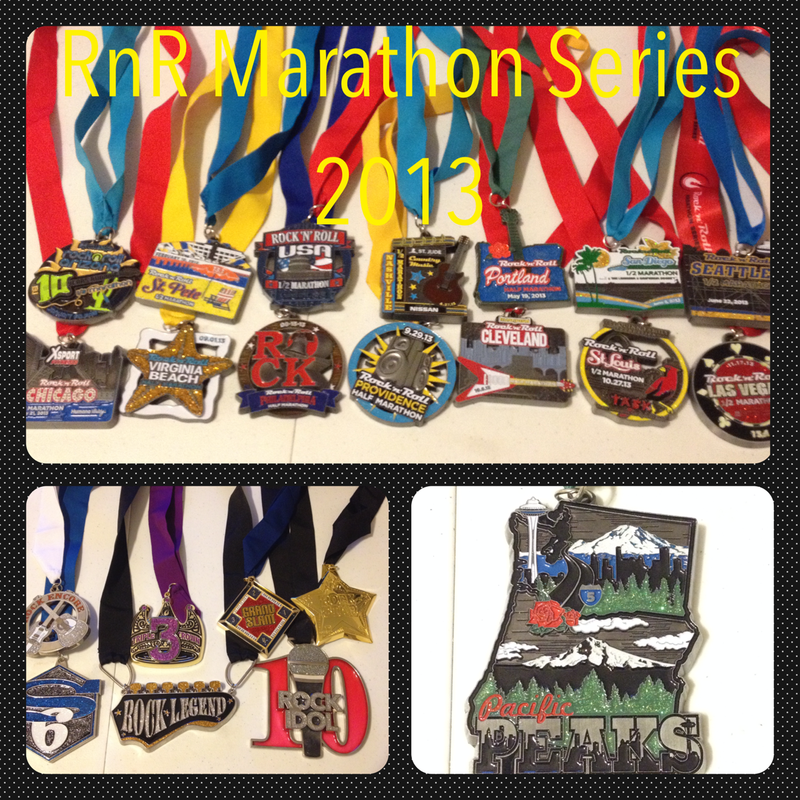 Have you ran any RnR races? If so, which one has been your least favorite and/or favorite race? How are you? Hope all is well! First of all, thanks for writing about your love for marathons. I admire your determination a lot! Also, thanks for mentioning our client, COMPETITOR GROUP (Rock N Roll Marathon) on your post. We really appreciate the mention! I’m glad you wanted to share information about Rock N Roll marathon with your readers. In line with this, would you mind linking back to us as a reference for anyone that is interested in learning more? Here is the URL: http://runrocknroll.competitor.com/san-diego. Nope, no pass next year. No point in running all of the same races again. The only one I might do is Las Vegas. I like their races because they’re well organized. I just think they’re so freakin’ expensive! I’m running the Rock n’ Roll half marathon in New Orleans on Feb 2! Great job running so many halfs this year! I am thinking of going to New Orleans but airfare is expensive! I’d love to run a Rock n’ Roll race series. I was supposed to run the Chicago Rock n’ Roll race this summer in July but my ankle injury made me pull out of the race at the last minute. Oh bummer. Hopefully you get to do one. They’re good races but i think too expensive.